CES 2018: NOKIA Sleep sensor announced, Offers sleep cycles analysis (deep, light and REM), heart rate tracking and snore detection. Today at the 2018 Consumer Electronics Show (CES) Nokia announced the launch of Nokia Sleep, an advanced sensor that seamlessly delivers personalized sleep analysis and offers smart home control through IFTTT integration. Nokia also announced the integration of its Health Mate app with Alexa, the cloud-based voice service from Amazon, providing users with data and insights on their activity, sleep and weight. Sleep quality is a key factor in maintaining a healthy lifestyle, with ongoing sleep deficiency linked to an increased risk of heart disease, kidney disease, high blood pressure, diabetes and stroke according to the National Institutes of Health. Nokia Sleep is a Wi-Fi enabled pad that fits under the mattress and provides insight into the quality of the sleep experience while offering environment control through IFTTT, an automation service for all internet-connected things. + Sleep cycle analysis: sleep duration and interruptions; light, deep and rapid-eye-movement phases; and snoring tracking. + An individualized Sleep Score is provided to indicate how restorative a night's sleep was, and educate users about what makes a good night's sleep and how they can improve night after night. + Smart Home control via the IFTTT home automation platform. Nokia Sleep acts as a switch to automatically control lights, thermostats and more by getting into and out of bed. For example, users can automatically dim the lights when they get into bed. + Nokia Sleep synchronizes automatically with the Nokia Health Mate app so users can have all their health data in one place. The app provides data history, personalized advice and coaching programs, including one developed specifically around sleep. Working with leading sleep experts, Nokia has developed the Sleep Smarter Program, available through the Health Mate app, which guides users during an eight-week period to help them understand sleep patterns and learn to have more balanced and regular sleep routines, especially between weekdays and weekends. Endorsed by renowned sleep specialist Dr. Christopher Winter from the Charlottesville Neurology and Sleep Medicine Clinic, the program has shown that users can increase their sleep by 12 minutes a night with small changes to their behavior and routine. Nokia Sleep will be available in Q1 2018 priced at $99.95. 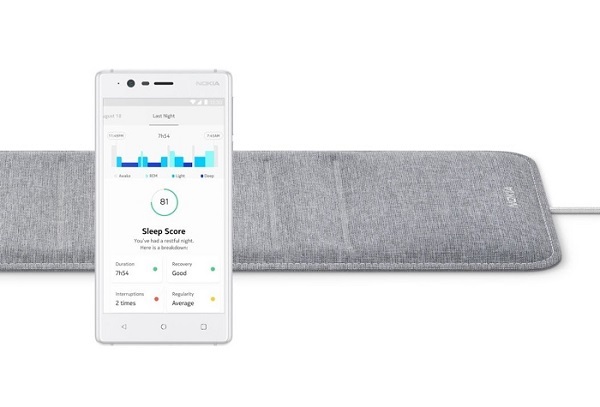 Nokia Sleep will be available via https://health.nokia.com/us/en/sleep, Amazon.com and other leading retailers.